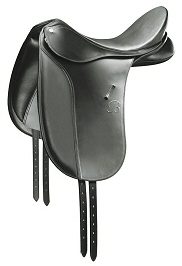 A classically designed dressage saddle offering great support for the riders sitting position. Bates saddles feature the ultimate performance systems, the Cair Panel System and Easy-Change Gullet System. Together they ensure unequalled comfort and performance for horse and rider through unsurpassed adaptability, even weight distribution and fluid cushioning for the horse's working muscles. Bates saddles also feature the Elastiflex tree, guaranteed for the lifetime of the saddle, which is rigid in the head to maintain clearance, whilst possessing lateral flex to work with the horse's muscular movement. All Bates leathers are pure aniline dyed, full grain, naturally finished from hand selected hides. The Adjustable Flexibloc System allows the rider to individually tailor their thigh and knee support. The Adjustable Y-Girthing System on some models secures the front and back of the saddle.